Thinking of creating your own DIY wedding invitations? 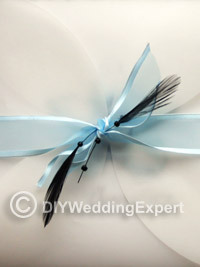 They are an ideal way to add a personal touch to your wedding and put your creative talents to use. The great thing about weddings is that there is so much you can do yourself, including designing your own stationery, and by doing it yourself you can involve family and friends and showcase your creativity! DIY wedding invitations can seem overwhelming, but in reality they are so simple to make yourself. The biggest benefit to DIY wedding invitations is that you can completely customize them to fit you and what you want the theme and tone of your wedding to be. Invitations are the first impression guests will get for your wedding, and by making your own invitations, you will give them a very unique first impression. There are a lot of different options that you can make yourself, from print-your- own invitations to invitations completely designed by you. It all just depends on how comfortable you are with your own creativity and computer skills. Print-you-own invitations are very easy to do. All you need is a printer, the wording you want to use, and the stationary. If you need ideas for what kind wording, the internet has a lot of different sites to get ideas from. Whether you want laid-back or very formal, it is completely up to you. For stationary, many craft stores have wedding invitation stationery, but you can be more creative and use cardstock paper that matches your wedding colors. Choose a pretty font and type up your wording, print it out on your stationary and you’re done. Viola! Completely designing your own invitations is not as hard as it sounds. The easiest way is with a digital scrapbook or some kind of design program. Browse the internet and wedding shops to get general ideas for what you like and what kind of invitation you want, and then go to work. Once you have it just the way you want, upload it to a quality photo printing place just like you would a photo, but request cardstock paper instead of photo paper. If you have a lot of help and want to involve family and friends, hand-making your invitations can be a lot of fun and very unique. Decide what kind of look you want for your invitations, and then gather your supplies, probably glue, cardstock, and embellishments like ribbon or charms, but there is no limit to what you can add! The end result will be uniquely yours and probably not something your guests will have never seen before. DIY wedding invitations are fun, and let you show your creative side. And because you can make them just the way you want them, they add a personal touch to your wedding.